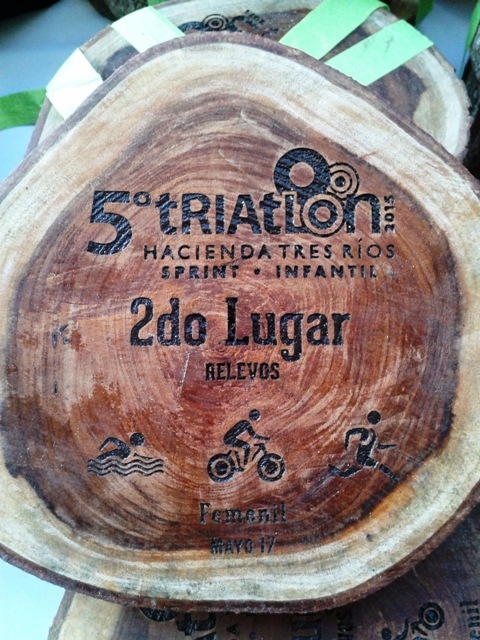 The 5th edition of the Hacienda Tres Rios Sprint + Junior Triathlon took place on May 17, 2015, a warm, sunny Sunday morning in the Riviera Maya. In just five years the event has become one of the most popular sporting events in the region. This year some 400 athletes, triathletes, runners, cyclists and swimmers ages 6 to 65 participated. A sprint triathlon includes distances of 750 meters swimming in the Caribbean Sea and natural rivers, 20 kilometers biking on the Cancun-Tulum highway and 5 kilometers running in Tres Rios Nature Park. The overall winner, who finished with a time of 1:00.04 hours, was Alan Michel Carrillo Ávila, from the island of Cozumel. Bruno Larios Solís, also from Cozumel, and Luis Alberto Aguilar from Cancun, finished second and third respectively. Victoria Juanicotena of Cancun was the first female participant to finish, with a time of 1:11.07. Fabiola Rodríguez of the state of Yucatan and Ana Beatriz Martín from Cancun came in second and third place respectively overall in the female category. In addition to the different ages in the sprint category, there were special distances for 6 to 15 year olds in this family-oriented event. Leading up to the awards ceremony, participants relaxed and refueled and enjoyed drawings and games with their friends and families. Hacienda Tres Rios would like to thank and congratulate all that participated. See you next year! To find out more about Hacienda Tres Rios Resort, Spa & Nature Park, visit our webpage.